Here's how to activate and sync your Apple Watch with your iPhone. Here's how to perform a quick setup and activation on your iPhone SE. Here's how to connect a wired headset to your iPhone. Watch this video to see how to move your content, pictures, contacts and more from your old Android phone to your new iPhone. Learn about the different options available to transfer your content when activating a new iPhone. Watch this video to see how to move your content, pictures, contacts and more from your old iPhone to your new one. Learn about the different options available to transfer your content when activating a new iPhone. Find out how to change the name of your iPhone SE. Discover the features on the back of your iPhone SE. Discover how to restart your iPhone SE. An interactive map of the Home screen and buttons on your iPhone SE. Here's how to restart your iPhone SE if it is unresponsive, frozen or won't power on or off. Here's info on the battery specs (e.g., Talk Time, Standby Time, etc.) for your Apple® iPhone SE. Here's how to charge your iPhone wirelessly. See how to pair your iPhone SE with your Bluetooth device. Discover how to add a numbers as a new contact on your iPhone SE. Find out how to block a new contact on your iPhone SE. 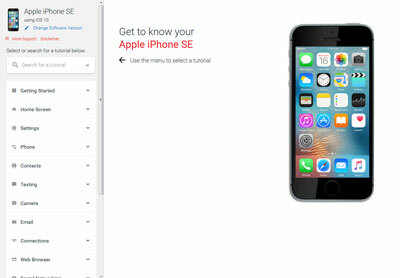 An interactive guide on how to change your call settings on your iPhone SE. Discover how to use your iPhone SE to make a call. For info on common camera settings (e.g., flash, HDR, etc.) for your iPhone SE. Discover how to capture a Slo-Mo video on your iPhone SE. Find out how to capture a Time-Lapse video on your iPhone SE. Learn how to record a video using your iPhone SE. See how to edit a photo using your iPhone SE. Learn how to change between front and rear view on your iPhone SE camera. Discover how to take a photo using your iPhone SE. See how to add a new contact to your iPhone SE. Learn how to add a contact to your Favorites on your iPhone SE. See how to add a picture to a contact on your iPhone SE. Learn how to assign a ringtone to a contact, so you know who's calling your iPhone SE without looking at it. Learn how to import and export your contacts on your iPhone SE. Here's how to restore your iPhone SE if it crashes, has a blank or frozen screen or connection issues. Find out how to access mobile network settings on your iPhone SE. Explore how to access Settings on your iPhone SE to change alert sounds, turn off GPS and more. Discover how to add an account on your iPhone SE. Discover how to adjust Auto-Lock preferences on your iPhone SE. A visual guide for swiping between multiple Home screens on your iPhone SE. Learn how to change the account settings on your iPhone SE. An interactive guide for changing the notification sounds on your iPhone SE. Learn how to check for and install a system update on your iPhone SE. Learn how to manage Location Settings on your iPhone SE. Explore how to manage the Background App Refresh on your iPhone SE. Discover how to manage data usage on your iPhone SE. Learn how to manage the battery on your iPhone SE. An interactive guide on how to remove an account from your iPhone SE. See how to dim your lights by scheduling Night Shift on your iPhone SE. See how to set up Touch ID on your iPhone SE. An interactive guide for setting your iPhone SE to Airplane Mode. Learn how to access your work email on your iPhone SE. Discover how to access your existing email account on your iPhone SE. Discover how to change email inbox views on your iPhone SE. Find out how to remove an email account with your iPhone SE. Learn how to attach a file, like a document or photo, to an email with your iPhone SE. Here's how to use 3D Touch on your iPhone. See how to add a widget on your iPhone SE. Learn how to add or remove a Home screen page on your iPhone SE. Find out how to create folders on your iPhone SE to help organize your apps. See how to manage apps and widgets on the Home screen of your iPhone SE. Discover how to manage widgets on your iPhone SE. Discover how to remove apps on your iPhone SE. Find out how to remove widgets on your iPhone SE. Learn how to use Quick Reply on your iPhone SE. Learn how to bookmark a website on your iPhone SE, so it's easy to find later. Explore how to change your Safari® content settings on your iPhone SE. Discover how to find clear the browsing data on Safari® in your iPhone SE. A visual walkthrough of opening, closing and switching between windows or tabs in the web browser of your iPhone SE. Discover how to change the language settings on your iPhone SE. A visual guide on how to charge your iPhone SE. Here's how to unlock the screen on your iPhone SE. Here's how to set up and change settings for the display lock on your iPhone X. A visual guide for setting screen security on your iPhone 6s to help protect your private information. See how to unlock the screen on your iPhone SE. Here's how to check storage space if your iPhone runs slow/crashes, apps freeze or you can't save media. See how to set up a mobile hotspot password on your iPhone SE. An interactive guide for setting up your iPhone SE as a Mobile Hotspot, so you can share your data connection with other devices. Learn how to manage open apps that are running on your iPhone SE. This only helps with viewing the SIM card number/ID on your iPhone. If you're having other issues with your phone or device, visit our Troubleshooting Assistant. These walk you through solutions for issues you may have with your device. Find out how to insert and remove a SIM card from your iPhone SE. Discover how to access your Facebook account on your iPhone SE. Find out how to add a Twitter acount to your iPhone SE. Learn how to log out of Facebook on your iPhone SE to help protect your account. A visual walkthrough on how to update your Facebook status and post photos using your iPhone SE. Learn how to tweet with Twitter® on your iPhone SE. Learn how to change message settings on your iPhone SE. Find out how to delete conversations on your iPhone SE. Discover how to send a text message with an attachment using your iPhone SE. Find out how to send images from your iPhone SE. Learn how to turn off notifications for group messages from your iPhone SE. A visual guide for how to turn iMessage on or off using your iPhone SE. Find out how to change the FaceTime settings on your iPhone SE. Discover how to create a medical ID on your iPhone SE. Discover how to perform a factory reset on your iPhone SE. Learn how to use FaceTime® on your iPhone SE. Learn how to save data by turning off Wi-Fi Assist on your iPhone SE. Learn how to communicate using 3D Touch on your iPhone SE. See how to use 3D Touch within an app on your iPhone SE. Find out how to use 3D Touch on the Home screen of your iPhone SE. Find out how to create a live picture on your iPhone SE. A visual walkthrough on how to view your health data using your iPhone SE. Here's how to enable voice control for number dialing on your iPhone. Discover how to change the background of the Home screen on your iPhone SE. Learn how to use your iPhone SE to connect to a Wi-Fi network, so you can access the internet without using data.